The learners who have to appear in the examination of NIOS DELED second semester courses (504 & 505) must be looking for guess papers & solved assignments. This practice workbook (D.EL.ED-504 & 505 Guess Paper with solved assignments) will help the learners in better preparation of their examinations. 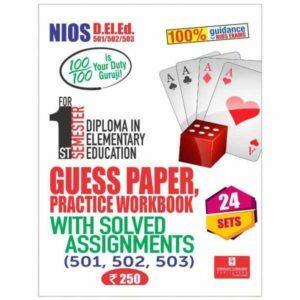 These guess papers has been specifically designed and developed for Untrained Teachers who are pursuing DELED programme from NIOS and they have to appear in the second semester examination. It is valid for learners who have selected English as their medium of instruction.